Providing comfort care to end-of-life patients and their families can be challenging, even for experienced nurses. “It’s a good one to see,” my preceptor Austin said. This was my first comfort care patient as a nurse, and it felt incredibly profound. The patient had come in a mere 2 weeks earlier complaining of some dizziness and fainting. What doctors found was advanced melanoma that had metastasized to the brain. Time sped up while her care team scrambled to collaborate on a treatment plan. Before they offered hope to their patient, they had to find it for themselves. 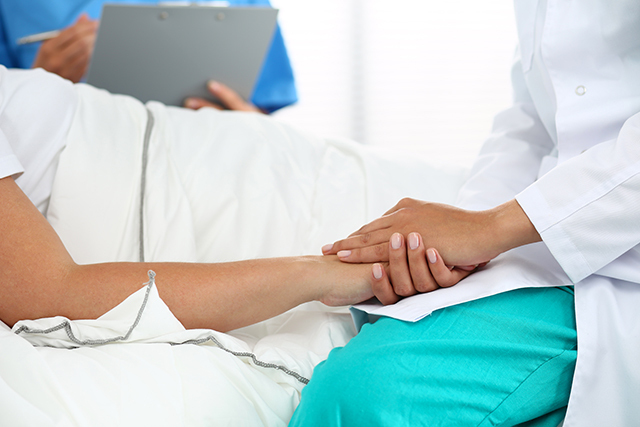 Through various consults and conferences with the patient and her loved ones, however, inpatient comfort care was the difficult but necessary decision that was made. I know this is a well-beaten path for oncologists. Part of me wonders if they knew where this journey would end when the initial scans were completed. Maybe exhausting all options was a way to honor the oath they took when they became healers. The patient’s room was situated directly in front of the nurses’ station, which felt odd. Almost like having a front row seat to watch one of the most intimate, heartbreaking, and strange events that can happen to a family. It’s different when death is unexpected and sudden. Everything is rushed, including the goodbyes. Hordes of family, friends, and acquaintances rushed through. Members of her church were by the comfort cart just outside her room praying. I couldn’t hear what their deepest desires for the situation were, but I in turn, prayed for peace for them. The patient’s husband made a schedule of visits, which made everything eerily streamlined. Most of the day was spent waiting in what felt like limbo. The family was desperate for some semblance of knowledge into the process of dying. Dying is not specific. It is unknowable, even for the most advanced practitioner. The doctor knew there would be no recovery by all clinical signs. This shocking, earth-shattering, and life-altering knowledge was his alone to deliver to the family that morning. I felt like a burden most of the time I spent in that room, as if I was constantly interrupting. Getting in the way of the goodbyes. Getting in the way of a family. After an awkward intrusion to perform oral care, one family member stood up and hugged me tighter than I expected and said “thank you” through tears. That moment is thus far my favorite. It was a moment in which I could not have felt more helpless. A moment in which I was humbled, stretched. I didn’t feel like I deserved in any sense of the word the privilege of delivering care to this family. It was also a moment in which I truly felt like a nurse. Danielle Gillaspie is an oncology nurse at Billings Clinic in Billings, Montana.